Between work, family, housework, hobbies, friends, reading, emails, calls, and all the other daily tasks, does it ever feel as though adding healthy eating to the list just feels overwhelming? I can almost hear your groan from across this page; “Meal planning? Who has time for that! ?” Hey, I get it. Life get’s crazy busy! And sometimes the idea of adding eating healthy into the mix sounds… well… overwhelming. But what if you could find a way to eat healthy in a way that hardly took up more time than driving to Chipotle for yet another Bulging Burrito? If you can relate to any of this (please say it’s not just me) then read on! Because I am about to show you the most quick and healthy meal ideas that you can make quickly that will transform your health as you now know it to be! With these fresh and fun ideas from the top 25 winners, you will find your meals transform into healthy culinary masterpieces in less than the time it would take to watch your favorite TV show! So, go ahead and grab your laptop and pop in your favorite episode while I show you the best recipes on the internet that you can make in 30 minutes or less! 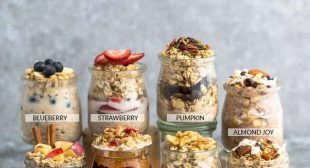 Since overnight oats have been a long time favorite of many people, it simply had to make the list! But this site in particular should strike your interest. With only a few minor tweaks, you can transform your dull morning routine into a flavorful and NEW treat each morning! Check out these amazing recipes by Life Made Sweeter for meals that will make you excited to get up each morning! Check out the recipe here! If you ever had Egg in a Hole (AKA Pirates Eye) growing up, then you know that nothing beats a nostalgic morning with one of your childhood favorites! This grain free Egg in a Hole is a surefire way to power your morning with protein and veggies all while bringing you the comfort of childhood. This is a twist on an old classic that you won’t want to miss! Check out the recipe here! Chia Pudding is pretty much a common household name these days. However, this one made the list specifically because it’s made with, to put it simply, the single most amazing concoction ever invented: Coffee! This genius recipe is not only super easy to grab and go, but it also saves you an extra step; grabbing a cup of Starbucks on the way. Check out the recipe here! This recipe has been a staple in my house! Since my husband is always looking for high-protein meals before his busy 6 am shift, protein pancakes often turn out to be his go-to! Now, don’t get me wrong, I love a good old smoothie! However, there are some days that just need something a bit more substantial! Since this recipe packs the same amount of protein while still giving you a good amount to chew, it makes this recipe a perfect candidate! Check out the recipe here! If you want something quick, filling, and high in protein, then beauty Jello might be the way to go for you! Since Gelatin is composed of almost 100% protein, you will have the blood sugar stabilization you need first thing in the morning. It is packed with water, making it extremely hydrating. And on top of that, gelatin is a form of collagen which is needed for beautiful hair, skin, and nails. Check out the recipe here! Speaking of smoothies, you will definitely want to give this one a shot! This protein smoothie will make you reminisce of fresh-baked snickerdoodles while never breaking your diet! Since smoothies are so quick and easy to make, they are a great option to add to your go-to breakfast routine! And this one should definitely make the list. Check out the recipe here! In the midst of our crazy busy lives, it can sometimes be hard to remember to stop and enjoy the little moments in life. The bright and beautiful colors in this smoothie bowl will help you do just that! With only 5 minutes to make this beautiful creation, it will leave you with a bit of time to enjoy your beautiful meal and just ponder what the rest of the day will bring. Check out the recipe here! If you are looking for ridiculously healthy meals that take no more effort than building a sandwich, this meal is a perfect idea for you! Jam packed with veggies and nutrients, these nori wraps will give you a sushi feel without having to load up on white rice (or dish out your budget!) Of course, if you are someone looking for something a bit more substantial, you could always toss a little bit of meat in there and call it a day. Check out the recipe here! My dear friends, let me introduce you to the collard wrap. AKA your new best friend in your fitness journey! Not only are they nutrients dense and a great low calorie option, but collard greens also provide a quick and easy substitute to throw together a meal in a way as easy as rolling a burrito. Of course, you can pack it with any of your favorite fillings. Turkey and lettuce, chicken salad, or tofu and peppers, but I have always been a sucker for chickpeas and avocado, so this one made the top of the list! Check out the recipe here! With cauliflower rice as the base, you will feel as though you are eating a carb-heavy meal, but for half the calories! This sushi bowl is designed to taste like a poke bowl, but is subbed with chicken so you don’t have to worry about hunting down some actual poke. I think you’ll find yourself falling in love with the tangy flavors of this Asian-based dish. Check out the recipe here! If you have ever gone to Chipotle, then you know there is nothing like the blend of rice and beans topped with the best Mexican favorites to make your mouth water! Thankfully, this recipe combines all of the best aspects of a burrito bowl with an on-the-go option! This is definitely one to add to your meal prep! Check out the recipe here! Collard Wraps taste delicious and fresh, but are one of the quickest and healthiest lunches that you could make! This instruction list will guide you through how to make an amazing wrap without even having to run to the store! Check out the recipe here! Who doesn’t love a good taco salad? I grew up having taco salads every Sunday. It was our family staple and it still has a place in my heart because of that! This recipe stood out among the rest for two reasons. #1- It looked delicious! #2- It is the perfect on-the-go option! Check out the recipe here! Of course, where would this post be without at least one tuna recipe? Tuna provides the perfect low-calorie protein that will leave you feeling full until your next meal! Say goodbye to late-night bingeing! Check out the recipe here! This became an easy pick for me because I loved how versatile it is! You can switch up the roasted veggies depending on what you have in your fridge, and it’s a powerful and hearty meal for those cold and rainy days. This is definitely a recipe you will want to bookmark! Check out the recipe here! Everyone needs a savory dinner every once in a while! Whether you are trying to lose weight or bulk up muscle, this chicken will give you everything you need to feel full and satiated all while building sleek lean muscle! Check out the recipe here! Lettuce wraps are a great option to reduce carb-intake for any meal! This is one of my top hacks that I consistently use for quick lunches that are extremely healthy! Because of that, this creamy avocado chicken lettuce wrap was quick to catch my eye! Thank you Heavenly Oven for putting this amazing recipe out there! Check out the recipe here! If you are ever in a pinch for a dinner party, then this antipasto platter has you covered! With no more than 20 minutes necessary to throw it together, this platter will become a new staple and lifesaver to your procrastinated meals plans! The best part of it though, is that even with such little time to prep, the beauty in the platter is sure to wow everyone in a way that will have them thinking you poured hours into this dish! Check out the recipe here! We’ve all heard that tapering off carbs towards the end of the day is a great way to reduce belly fat and increase sleeping abilities! That makes this Shrimp and Avocado a perfect dinner idea! With hardly any carbs in this quick and easy dinner, you will go to bed feeling relaxed and wound down for a good nights rest. Check out the recipe here! Who doesn’t like a one pan meal? Whether you are hoping to make leftovers, or feed your entire family, this meal is a perfect option for a quick and gourmet dinner that everyone is sure to love! Who would even know you are chowing down on a day’s worth of veggies in the process? Check out the recipe here! Sheet pan dinners are an awesome way to enjoy all the flavor of a roast without the hassle of actually roasting it! This Fajita recipe is as simple as cutting the ingredients, seasoning, and popping in the oven! Check out the recipe here! Another sheet pan favorite is this Greek chicken! The looks of this savory meal will have your family fooled into thinking you were cooking for hours! They will never guess that it only took you 5 minutes to prepare everything and pop it in the oven! Check out the recipe here! These Shrimp Veggie Noodles will have you craving healthy food every night! With no more than 15 minutes needed to cook, this meal will become a staple that you will easily be able to squeeze into your busy lifestyle! Check out the recipe here! There is something about the comfort of a skillet that we all crave! They are a great option since you can easily throw one together using whatever you have in your fridge. This one was particularly inviting! Anyone else getting hungry? Check out the recipe here! I have not met a single person who does not love egg rolls! When I discovered I was celiac, egg rolls was one of the first foods I remorsefully thought about! If you are in the same boat then you will be thrilled to try this Egg Roll in a Bowl Recipe! The flavors in this recipe will have you feel like you aren’t missing out on anything! But it is especially healthy! Check out the recipe here! Yes, eating healthy might sometimes seem like a hassle, but remember that the energy and productivity you receive from it will return an investment 10 times what you initially put in! And, if you do it right it won’t take up very much time at all! If you follow these tips, tricks and recipes you will find yourself eating consistently healthy without feeling pressed for time! And if you need any more ideas, I’m always here to help you out!